It's been a little quiet on the blogging front this week, but have no fear I have indeed been busy sewing. In fact, I have spent quite some time on my design floor and behind the sewing machine. 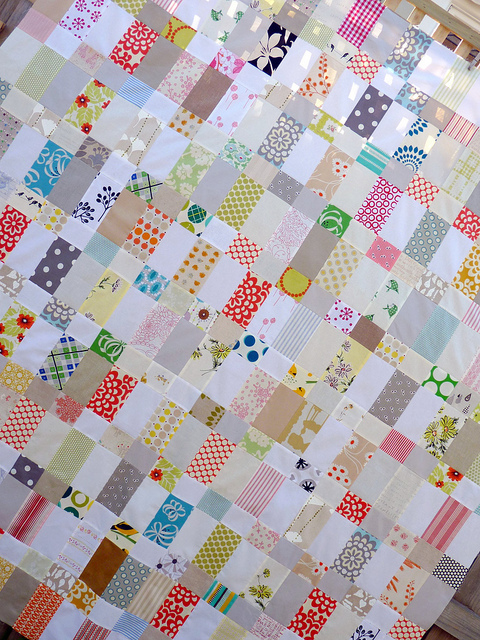 If you are a long time reader of my blog you may recognize this quilt. 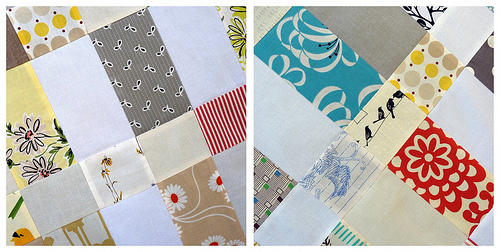 I have previously made a smaller version of this Strips and Bricks Quilt, way back in June last year. The quilt design is by Malka Dubrawsky and was featured in the April 2009 issue of Sew Hip Magazine. My original quilt was purchased by a customer who loves it so much that she has since requested a larger version of the same quilt. 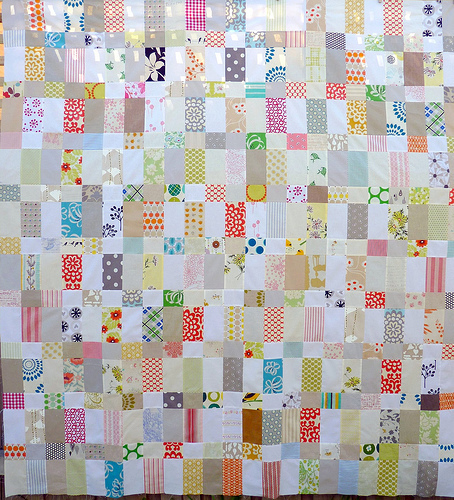 The quilt top made this week measures 70 x 70 inches, which makes photographing just that bit more tricky ! (Don't let that little bit of sunshine coming through the quilt top fool you either, it was rather cool here this morning). I have tweaked block measurements to suit quilt size. 437 individual fabric pieces were laid out on my design floor, and after much rearranging they were methodically pieced together. Perseverance. There are lots of little detailed prints in the quilt for added interest, although I think it is the quilting itself that will give this quilt its character. But first I am going to have to await the arrival of the backing fabric. Patiently. Very pretty! Looks like a big one to quilt! Did you say design floor? With that much up and down, no need to go to the gym. You must have buns of steel! Malka's simple design on Strips and Bricks is one of my all time favourites and your interpretation is beautiful, it really sings! Looks great - I am such a fan of 'proper' sized quilts - I love seeing how repeats become less important than the fabric choice used for the repeats as the quilt gets larger and larger. Fab job! What sort of backing fabric will you use for something as detailed as this? And where are you sourcing it? I'm struggling with this issue myself at the moment. I'd love you to write a blog post on your philosophy on quilt backs -- unless you've already done that and I've missed it? It's beautiful Rita, good job. I love the colors, it's so fresh and full of energy! Once again, good job and keep it up! Unless it's the light playing tricks, I love the different shaded solids you've used in there. amazing, as always! you go Rita! That is the ultimate compliment! How wonderful that she loves it and wants another. You just can't beat that. This one is gorgeous too. Can't wait to see the quilting on this Rita. Its a wonderful quilt! So much beautiful fabric there. You're such a tease - can't wait to see the quilting now. I hate waiting for fabric once its all ready to quilt. Hope it comes soon. I love the white and grey neutrals together with the wonderful prints. And those birds on a wire...I am oooo-ing and ahhhh-ing!!! I have to say, I can totally understand your customer asking for another, bigger, version of Strips and Bricks. It is one of my favorites of your quilts--I'm constantly in awe of how just a few little pops of color don't seem obtrusive, but still keep your eye moving. It's another beauty, Rita! This is absolutely gorgeous. And when you showed the birds on the wire in one of your previous quilts, I just couldn't stand it they were so cute. Placed an order with pippijoe and the birds on a wire fabric is now sitting on my sewing table and making me SOOOO happy. Is there a pattern I can purchase for this quilt as I'm not able to get that magazine. 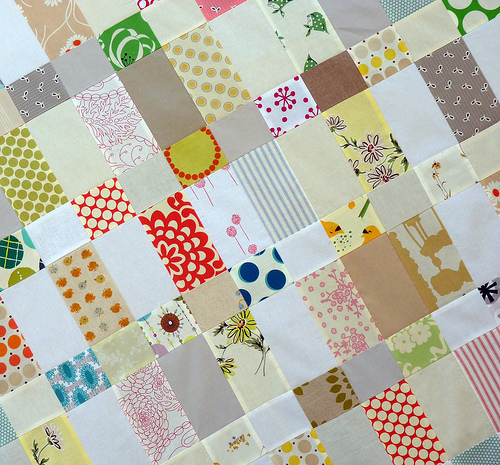 Your quilt looks fabulous and a great way to use up some scraps! Beautiful! Lovely and soft and the interesting novelty fabrics are terrific. Adore it. More of these, please!